Talia Halliday's boozy book stows your spirits away until you're ready to share with your favorite bookworm. Taking a page from Prohibition-era stashes, Talia Halliday's boozy book stows your spirits away until you're ready to share with your most trusted partner in crime. 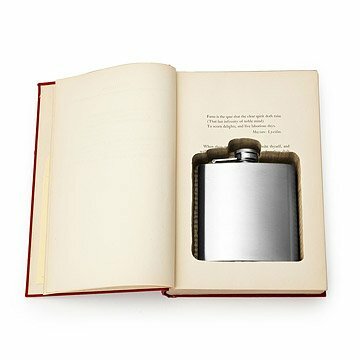 Made from reclaimed library books, the warmly weathered cover opens to reveal the first few pages of a well-loved novel, then a final flip reveals a hollowed out holder for the included 6-ounce flask. Set this handsome vintage tome on your bookshelf and channel your inner-Hemingway or Bukowski whenever the occasion strikes. Handmade in Indiana. When Talia Halliday became a biological mother for the first time, she recalls finding that she "needed an outlet, a catharsis—and making was just that." She had bound books in college, and she started in earnest again. What began as an escape soon turned into a business—one that allowed the Indiana-based creator to give the discarded books she found at her local library new life, and the new owner, their own little store of secret knowledge. "I wanted all of my designs to focus on repurposing materials, and creating something new and beautiful from something lost and forgotten," says Talia. Mission accomplished. Vintage books can be delicate, handle with care. Please note: each Flask Book Box is one of a kind. Size, title, color, and genre will vary. Sent to France as birthday gift. The book is beautiful and in perfect condition. You would never guess what is inside! Made a great gift for a "bookworn"
Fun, cheeky gift for a girlfriend that loves to read...and have fun! This "book" looks great on a shelf and keeps us laughing. It's a great little secret and reminds us that there's always fun in life along with hard work. best gift I have ever given! My nephew opened this gift...of course, at first he thought it was a beautiful well constructed book about Italy!! Wrong! When he turned the pages and found the flask inside he was overwhelmed with surprise and could not believe how clever, not to mention useful! Best gift ever. Reading just became more interesting! It's a fun gift and unique. We received what we ordered, but was slightly disappointed with the quality. It was a little sloppy. The flask rattled around in the book box and the cutout for it was uneven. It would have made more sense to not cutout every page to make it seem like it was more of a book then to see the hidden flask. Also wish we could have chosen what type or style of book or at least suggest the type. I feel we paid way more than what we got. Great product. Love that it was a reclaimed library book. Sustainable. Great gift idea for the reader who has (almost) everything.